So this review will be pretty short considering I can't play it with people right now. However, I love the colors and the premise. The game took a little getting used to and I wish it had a bit more polish though maybe the demo just feels more wonky to me controls-wise. The premise alone is great enough to earn this a solid grade. It's a 2D classical platformer but the background changes colors constantly… which means platforms of those colors will disappear and you'll find yourself in hot water. While a single player campaign of some kind is planned, the point really is the multiplayer racing which supports I believe up to nine racers. Everyone just running around like crazies should be fun. Like 2D Koopa The Quick Racing but the mountain can disappear from below you. I had seen this on Steam for quite some time. It looked interesting and fun. When I loaded it up I was instantly caught by the music and menus and all that. Gameplay seems fun from what I've done. It's your typical shooter but it's more like an obstacle course. 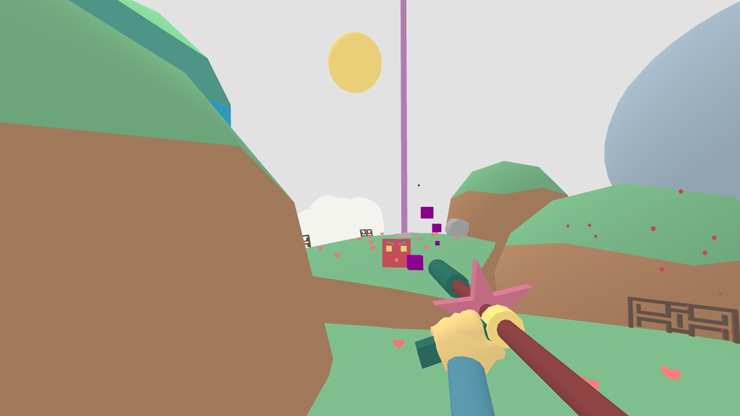 So besides being first-person view, you have infinite ammo and random creatures shoot at you like turrets. I'm sure the enemies get more crazy as the game goes on but one thing kind of ruined it for me with this one. I want motion control aiming. 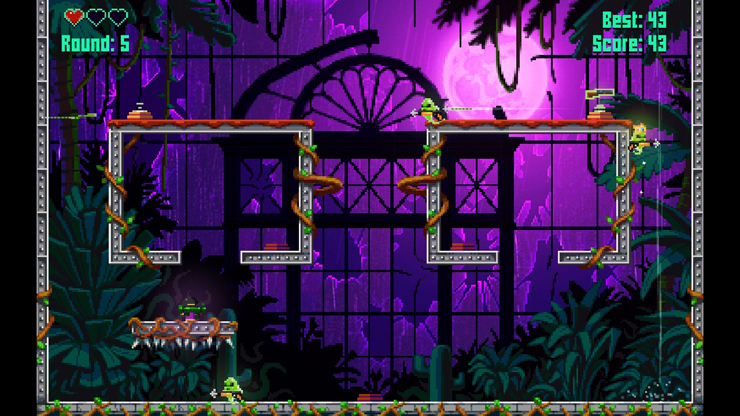 The enemies tend to shoot fast and it can get nuts trying to use both joysticks at once. Other veterans of the genre probably won't mind but after weeks of Splatoon, I can't go back to classic controls. If I could have motion controls for aiming and leave the joysticks for moving around, this would be way more fun for me. Even with simple graphics, it's clear who wants to get you. Some crazy old-school pixel art here. This is a demo I didn't feel confident about enjoying going in. The premise here is it's a platform game but your play through in the first round is mimicked by the ghost enemy of the second round. You defeat him, and both previous rounds are mirrored in the third and so on. After a handful of rounds, when things get crazy, it's time to exorcise the main crown ghost. In the end it turned out to be more fun that I thought. The platforming is more like challenges and the levels more like challenge arenas. The clever scenario this puts you in is that YOU are the A.I. I wonder if this means people can quickly learn how to outsmart themselves or if craziness is bound to ensue no matter what. Not convinced I'd buy it but this was a surprise. I heard negative things going into this and I'm glad I tried it anyway. It's weird! It's mellow! It's sci-fi exploration where you're a mere patrol bot or something and you have nothing but your shield for attack and defense. Weird creatures with pink-glowing weak spots dot the landscape. The music is subtle and funky in it's own right. The game reminds me of Limbo but you can float and fly and explore a deep cavern. The graphics are Limbo-esque as well with harsh contrasting colors but the main difference there is just that, color. I am very likely to want to pickup the full game presuming two things. First, I need it to not be over super quick (or at least be priced right for it). The second point I need is some kind of inkling of a story. Limbo barely had one but it made you think by the end and asked a few questions. I want some kind of reward here for getting through the game and that reward is best dealt through feeding my curiosity and satisfying it at least somewhat. Ah, there's also a life bar (that I didn't originally notice) and you occasionally find question mark blocks and special orbs… the meaning of which eludes me and extends my curiosity. This is zoomed out from normal view because of my location but it provides a good sample of the landscape. This is a rare foray into the bullet-hell shooter genre. I never enter here because usually they tell me to go back where I came from… where I'm wanted… where I can handle things… This genre has never been my thing. Totally expected to hate it. I don't. The game looks really nice and continues to get nicer as the battles wage on and on. I'm still not very good and the controls are a bit interesting. There's no real smoothness to aiming your guns which probably is great for most gamers but for me it was hard to get the angle I wanted, especially when everything is flying at you from all angles. In the below screenshot I had infiltrated some kind of spaceship after a really cool asteroid field. These little buggers are like bees who do not like me in their hive. I'm sure this is going to be a great game for certain folks. I can't recall who it was (GDG?) but someone around here already said they really enjoyed this. However, it's not really up my alley. This screenshot makes the game look easy… but it is not! For a demo, the load times were pretty horrendous. I guess it was just the one load time but still. Then again, there's a fully three dimensional world to explore here, unlike the 2D games I've previously demoed. The frame rate is abysmal but again,… demo. I wonder how or if it will improve. It has to in order to be playable. It's really sluggish. I am desperate for a run button or some kind of goal. Is this supposed to be Myst of the new age or something? I've never really played that but I know it's beloved (and point and click which this is not). This demo just really boggled me. I had zero fun and was antsy to just turn it off. After wandering around for a while that's exactly what I did. The only reason it doesn't get an F from me is because when I made it outside finally it looked like there was potential. Hopefully others either stick with it longer or find some kind of enjoyment from this. I thought I saw a person and then I didn't. I have barely played anything in the Mutant Mudds franchise. I appreciate it for what I know but it felt a little slow and boring in the past. I was curious about how a super challenging version would grip me and well the music was a strong start. Plus I heard that Rusty from SteamWorld Dig is a playable character in it so… that's very enticing. I booted it up and got going. I died quite a bit but a lot of them were dumb because I didn't know the controls or that I could be squished or how the jet pack worked and all that. Once I got going the challenge still stayed around and I appreciated that. The foreground/background aspect was neat. Not sure what the point is exactly but who really cares? Lots of coin things to collect and I found myself looking for every last one of them. I found some secrets and yet others still eluded me… I would come back to this. I tried the other levels and made it through the apparently harder second demo level with relative ease. Still was tricky and the background/foreground distractions were WAY more involved. I hate and like this aspect, lol. The last level is a boss level… a ghost. As far as I understand it you have to get weapons in the background, make it through the maze without using all your ammo, then go to the foreground to do damage to the boss. This is really hard. Wow. I think I'll end up picking this up, with Rusty or not. (but it helps he'll be in it) I am now way more concerned about how hard it'll be. I hope overall it rates as fair and not unfair. I had heard how this one was supposed to be… a new kind of Sonic The Hedgehog. With that said, I jumped in. It had a classic SNES/Genesis feel that's for sure. The title screen oozed this. The game is pretty dang cool. For one the level I played was varied with a bunch of branching paths and in some ways it was overwhelming. I noticed a timer counting up just like in classic Sonic but also there was a gem counter being counted DOWN. I wondered what happened at 0. This character runs like Sonic does and levels are designed somewhat like them with your classic springs and everything. The enemies who perish explode with creatures escaping from their mechanical tombs. There are special moves which allow you to spin like a helicopter, dash like a rocket, or attack with your hands! This is freeing a bit from the limited spin of the Sonic franchise. The demo level continues to show us why this is a game that matters. Suddenly I fought a mid-level boss! It was pretty easy but surprising nonetheless. Then the next area had water areas which had limited breath. This was such a neat experience. I'm very eager to see more and I could definitely see myself buying this game as well. It hit me in the right spots. Finally, a new and cool mascot! Love the design. I'd disagree with your Rive demo score myself. Game of the @Home demos. A (or at least A-) for sure. Can't wait to play the full game! It might have been me you're remembering. The other one that has me most excited is Extreme Exorcism, although I'd need to play it with friends to get a real sense of how good it is. And Runbow is on my radar mostly for the 9 player stuff, albeit the demo felt a bit so so to me. I really liked Freedom Planet. To me it feels what a true Sonic game on the 32X might have looked like. I loved that while it had the speed of a Sonic game the slower sections had much more Mario-ish jumping physics. Hearing that Runbow will have online at launch, I think I'll download it for the discount in case we get a good community going here. The rest I will wait for sales on PC as I typically do or perhaps another Nindie bundle. Actually, are any of the others Wii U exclusives? I'm seeing Typoman may be. Maybe I'll check those ones out too. I only downloaded a few of these, so it was nice to read about all of them. I'm going to download Extreme Exorcism now since it sounds kinda cool. The Runbow showcase on Nintendo's Treehouse stream was great. It's hilarious seeing a bunch of people frantically adapt to the spontaneous color changes and try to reach the end of the level. I don't think I'd be able to organize a 9-person Runbow session very often, so I'm happy that there will be an online mode in the full game. The single player stuff seemed like it could be enjoyable, too. Freedom Planet may end up being my GotY. The demo hit all the right notes for me. I've already played it three times and am now dying for the full game. I also loved Rive, despite the horrible stuttering that occurs every once in awhile. If they can fix that, I'm in. Lovely Planet was also great but holy hell, this game needs gyro aiming BADLY. I really hope they can implement that into the final game. I played everything else but none of the other games really did it for me, though none of them were bad. Runbow was pretty cool and I may end up buying it but I wasn't blown away by the demo. Mutant Mudds Super Challenge is more of the same. I'll probably get it at some point, but I'm not excited for it or anything. I'll wait for reviews of the rest of the games before deciding to buy any of them. Forma.8 feels like a good fit for me. I love the slow but smooth control and the audio track sounds like a Nifflas effort. I didn't figure out how to get past the big spider monster tho. Have yet to try Rive & Typoman. Runbow isn't going to cut it for me... unless the online stuff comes good. But even then, I wasn't loving the controls. Ah yes, the spider. You must place a bomb and use your shield to shoot it into the spider's weak pink spot. That makes me like it all the more. I've deleted the demo but I'll keep an eye on the actual release. Like you say, game length & story will factor. I tweeted the devs about that and they're definitely going to work on it. It just happens when the game auto-saves so it causes a small stutter when that occurs. I've only tried a handful of them (Typoman, Lovely Planet, Freedom Planet, forma8, and Mudds), but all of them were solid. Mudds was even decent, and I didn't care for the first one all that much. Lovely Planet was my least favorite, but that was because of the alpha version controls. Lack of inverted y-axis controls and gyro controls really hindered my progress. That game was pretty and the music was catchy. Rive was slick and fun and dramatic. I liked it. Might bite. Typoman seemed great. I want more of that too. Hope they can keep that level of inventiveness up throughout. 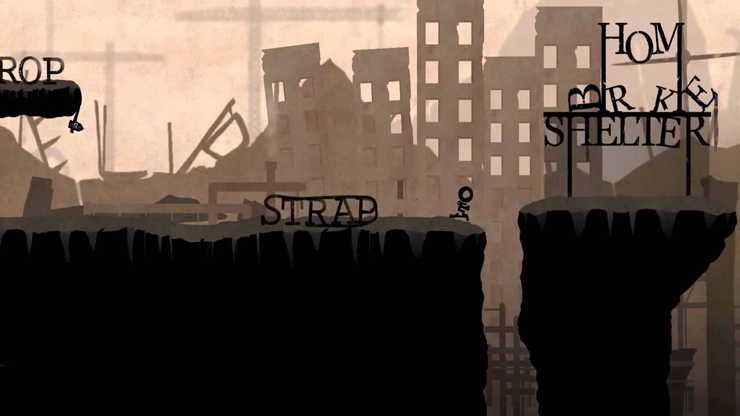 Typoman – Interesting concept that I want to play more of. 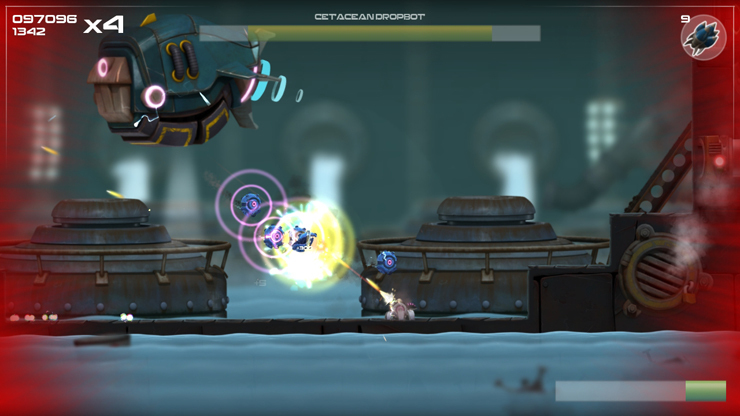 Rive – Not usually my kind of game, but I liked the demo a lot. 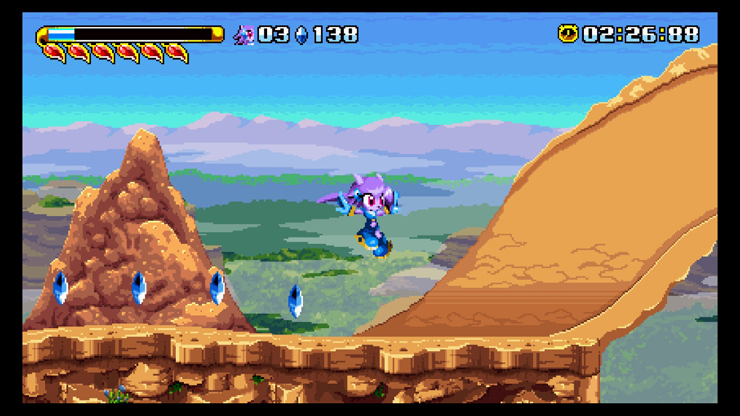 Freedom Planet – Feels like a Sonic game in a good way. Curious to play the full version. 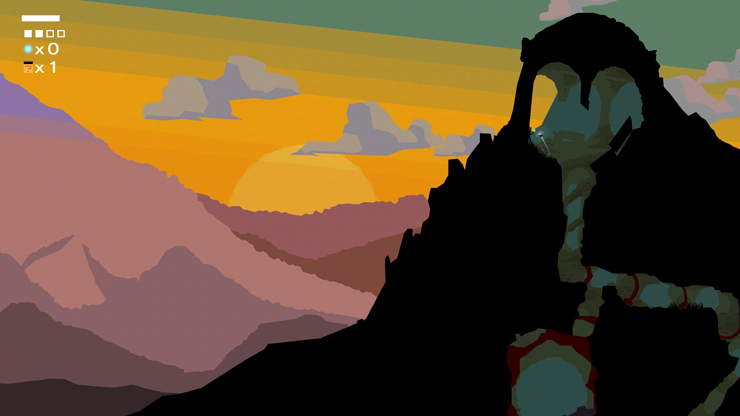 forma8 – Relaxing, atmospheric, and eerie. I want to play more of this. Extreme Exorcism – I probably would have enjoyed this with more than one player, but I like the concept. 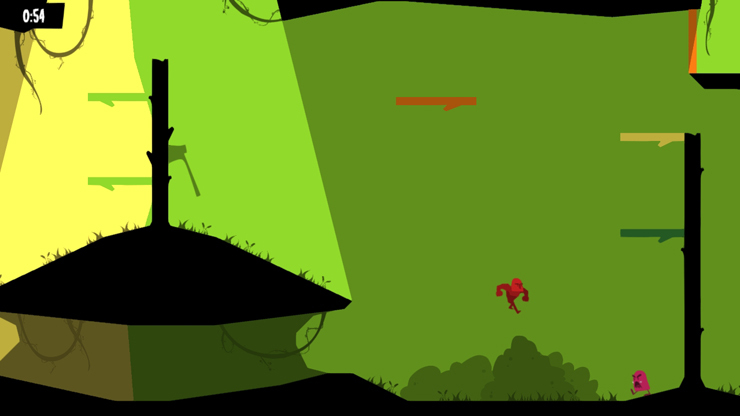 Runbow – Same as above. Lovely Planet – I like the idea, but the lack of control options soured me on this (though I'm sure it will be fixed in the final version). 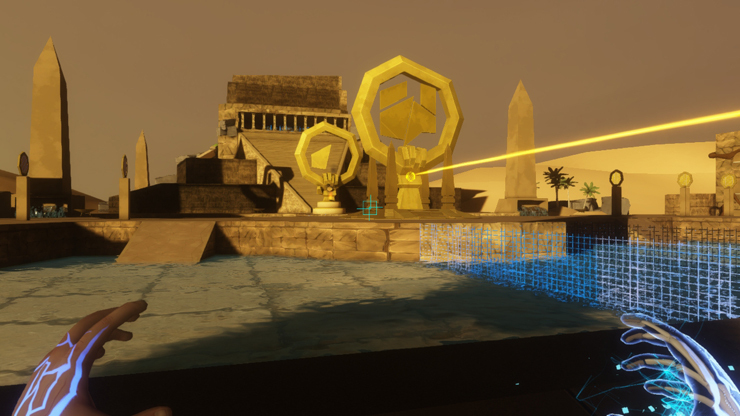 Soul Axiom – Interesting concept, but the game needs a lot of polish. A lot. 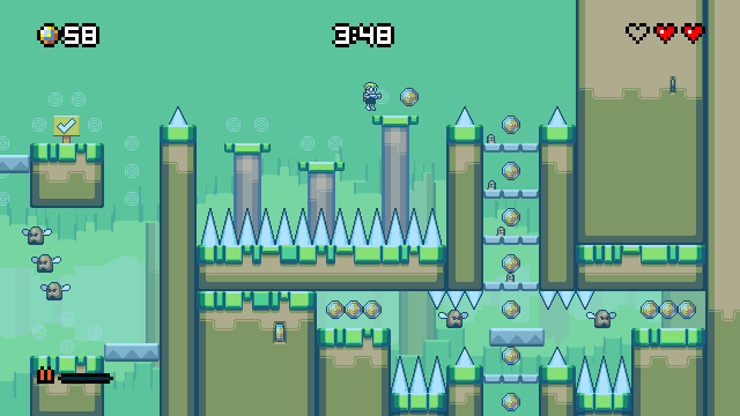 Mutant Mudds Super Challenge – More of the same (with a nice boss fight). Solid, but eh...dunno about this one. Finally finished trying out all of the demos. Lovely Planet and Soul Axiom didn't do much for me, and Typoman was a little rough, but I found the other demos to be surprisingly fun. My two favorites were probably Extreme Exorcism & Runbow. Did you buy Runbow? Will you be? I did and am enjoying it so far. Haven't picked it up yet, but I probably will. How's the online? Is it smooth and populated? Haven't tried it online, just me and Erika. It's fun with that so I bet 9 is crazy. But I think that it might get frustrating since if you lose the level then you have to wait until the level ends. Does anyone know the status of forma.8? I've been waiting so patiently for that game and I haven't seen jack on it's status. No clue but they talk about its development a lot on Twitter and just mentioned being on a Nintendo release list last week so I imagine it's still on the way.